We have a economical and easily installed solution to all your security and safety problems. Whether you are trying to prevent access to parts of your warehouse or shop, securing your store during closing hours, or providing ventilation on hot days without compromising security. We can divide spaces into aisles, create temporary no-go zones for restocking or maintenance, keep pedestrians away from hazardous areas. We design and install wire mesh partitions, with access doors and service windows. Call us with your problem and get an economical solution, fast and easy. 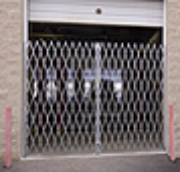 All our gates are precision made in Chicago, galvanized for appeal and longer life and usually available within 3 - 5 days. We have powder coating options and every configuration imaginable.